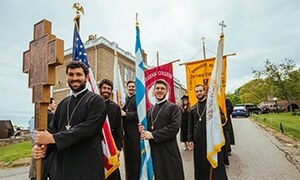 The rigorous graduate programs offered by Holy Cross Greek Orthodox School of Theology will challenge you to hone your critical and compassionate thinking, effective communication, and ethical discernment skills while demonstrating a spirit of love and gratitude to God through worship, service to neighbor, and active participation in advancing the Church. The intensive Master of Divinity graduate program prepares both men and women for a life of ordained or lay ministry. Graduate students learn to exemplify and to articulate the Orthodox tradition in its pastoral, liturgical, biblical, patristic, dogmatic, canonical, ethical, and missionary aspects. MDiv candidates develop knowledge, sensitivity, and faithfulness to the Church’s liturgical life through daily worship. Directed formation opportunities and supervised field education connect classroom learning to real-life experience. MDiv graduates become priests, deacons, theologians, chaplains, religious educators, youth ministers, or pursue further graduate studies in a variety of disciplines.